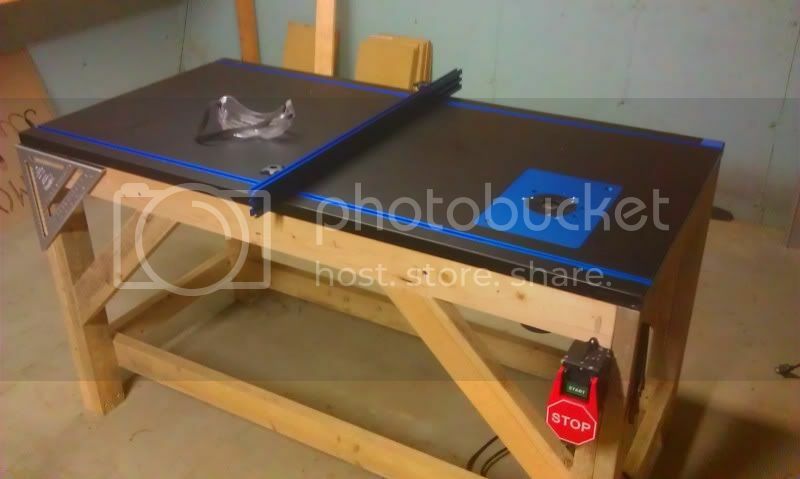 I've been planning a router table strictly designed for acrylic fabrication for some time. About five months ago I put together a "dream list" of items from Rockler woodworking. I recently received the last items on my list and am ready to build the new table. I'm confident this new table will produce edges that will lead to consistent bubble free, super strong joints. I'm also having glass cut for a rimless tank. I'll be building this soon after the router table is finished. The tank will be a nano. Dimensions will be roughly 30"Lx16"Dx16"H.
I'll be building a sump and overflow for this new tank. Not to sure at this point if I'll even set it up when all is said and done. I have a good friend that is learning a ton about reefing using a starter system, if he makes it through the school of hard knocks and graduates as a master reefer, something like this might be right up his alley. Anyway... I'm looking forward to the whole thing. Last edited by Landon on Sat Jul 28, 2012 11:55 am, edited 1 time in total. Re: Acylic and Glass. Time to start crafting. OMG awesome Landon, can't wait to see what you do with this thing! I'm hopeful that Santa will bring me some goodies to help move things along. I fried my impact driver and busted my Kreg jig so I'm hoping that replacements for these won't be far off. We'll see how things shake out. I think right now option 1 is looking real good. Just need to think about lighting a bit and will make my decision. Is the only difference between option 1 and 2 the thickness of the glass? I wouldn't have thought there'd be that much of a jump to go from 1/4" to 3/8"...do you think at that size you really *need* the thicker glass or do you just like the added security? Sula wrote: Is the only difference between option 1 and 2 the thickness of the glass? I wouldn't have thought there'd be that much of a jump to go from 1/4" to 3/8"...do you think at that size you really *need* the thicker glass or do you just like the added security? I feel that I need the thicker glass for extra safety, our house is pretty small and this thing will get bumped for sure. I would really like to build it out of acrylic but am a bit worried about the scratch issues in our crazy house. I can't wait to see the finished product. Wish I was handy enough to build my own tanks, course if I could I'd probably have a basement full of them already. Router table is almost done. Just need to install the router plate and will be all done. Will have some pictures one night this week. Happy new year! Landon your tanks are awesome! I am about due for a new tank setup myself. Looking forward to updates. Your setups are always top notch. Driving me crazy. Had a "must do" bathroom remodel come up. Will have some cool updates in two weeks. Thanks for the kind words guys. Router table is ready to rip. Wow. Been a while since I updated here. Been a super buys landscape season, and its only halfway done. I've been gathering speed on all the goodies for the 40 gallon tank I'll be setting up. Been very patient and picking up some cool stuff, its driving me nuts not to jump right in but will need a little bit of Fall to hit to make everything work. Icecap 250W SE pendant and Icecap ballast. Gonna run a Radium. Not gonna have any t5's with this to start with. I have a ballast and some pieces, just wanna try the Radium alone for a bit. Reef Octopus Needlewheel skimmer, grabbed it from a patron on reef central, little crusty but the guy said it skimmed like a champ. Hoping to get a Mag7 return pump this weekend. I still have all my RO/DI stuff just waiting in the wings. Turns out I have a bunch of real nice pieces of acrylic sitting around that will make a real nice simple sump for this system. Gonna run the pieces and start construction this weekend it looks like. I still have to order a overflow from glassholes, was just gonna build one but their price seems awful good for what you get, I was happy with the 300 gph overflow I picked up from them a while back, gonna go with the 700. That leaves water movement. I think I would like a Vortech MP40 but not completely sure. I'll be keeping mainly zoas and lps (or thats what I tell myself anyway ) I have no experience with the Vortech stuff, anyone shed some light on this a bit? Suggestions on size? 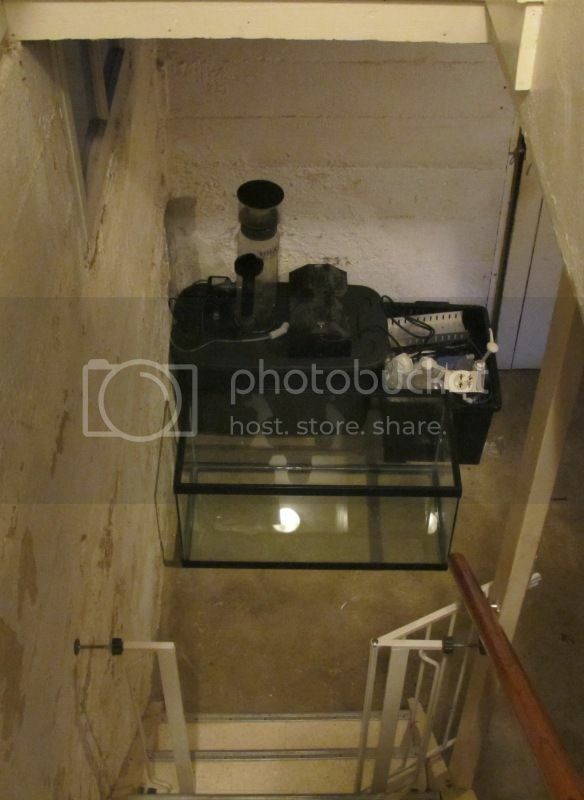 Heres what I see everytime I walk past my basement steps.... I'll never make it to Fall. MP40 will work great just can't aim them so you might want to think out your rock work before making your decision.